Runaways has quickly become one of my favorite shows on television. It features a diverse cast of interesting characters, great acting, and an on-the-edge-of-your-seat storyline. The plot revolves around six high-schoolers, who although were once friends, have fallen out of touch throughout the years. They discover their parents are in charge of a secret organizations with mal intentions, while simultaneously finding out that some possess supernatural abilities. The kids then embark on a mission to get revenge for the victims of their parent’s operations, as well as prevent the organization from any further destructive work. Although at first the characters all seem to be walking stereotypes (the goth girl who suffered a familial loss, the church kid with a dark secret, the athlete with an abusive father, the annoying younger sibling who just wants to be loved, the nerd crushing on a girl he can’t have, and the social justice warrior trying to fight her feelings), the characters grew on me as I watched the show, and I lost that mentality. Each of the character’s features an individual personality, specific mannerisms, and a backstory that contributes to both of these in a comprehensive way. The acting of course, must be given credit for part of this. For one thing, this show features the only accurate portrayal of a character dealing with anxiety I have seen on screen. As someone who has dealt with mental illnesses it was refreshing to see an Ariela Barer represent the experience so perfectly. The rest of the cast, however, deserves mention as well. In particular, the actors and actresses that brought the kid’s characters to life. Virginia Gardner plays a character who struggles with embracing her sexuality. What I appreciated about this aspect of the storyline is the care and individualism it was quite clearly treated with. Many similar storylines on tv and in movies are all identical, but Gardner (as well as the writers) obviously poured much thought and effort into making sure that this story fit the character. Rhenzy Feliz and Lyrica Okano’s performances also stood out to me. They played their respective character’s so well that while watching the show I felt as though I was watching real people, rather than a work of fiction someone had produced from thin air. Besides diversity in mental illness and sexuality, the show also has commemorable female leads, and although the racial diversity is not great, it’s certainly better than I’ve seen in other shows. Of the six high schoolers the show follows, only three is white, but none of the people of color in the show seem to fall into a stereotype. I also must note that the second season has a more racially diverse cast. 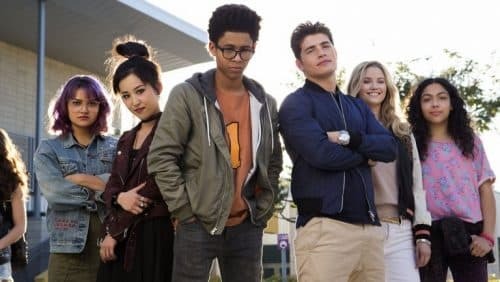 Runaways has quickly become of my favorite tv shows and is something I recommend to everyone I see, no matter their interests in tv.